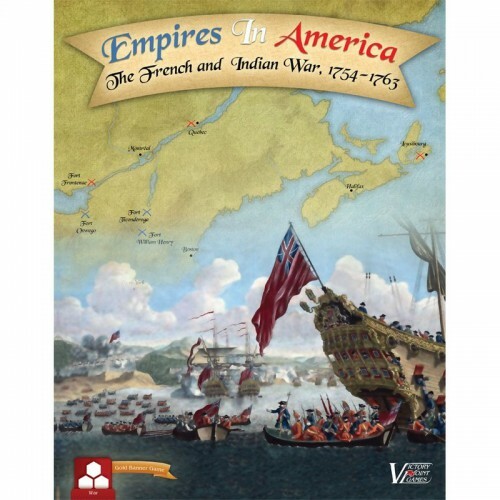 Created by veteran designer Joe Miranda, Empires in America is a States of SiegeTM on The French and Indian War. With riveting solitaire gameplay action, you must command the beleaguered colony of New France, from Halifax to the Ohio Valley, while Britain and her American colonies press in from all sides as war rages from the fortress of Québec to the Monongahela. Employing Leaders to command opposing Armies, Empires in America presents a new focus on the important historical personages of this era such as Montcalm, Wolfe, and even a young George Washington. These Leaders establish their reputations as their fortunes wax and wane on campaign across the far-flung frontiers of colonial North America. Can the Montréal Militia and Algonquin Indians defeat General Braddock’s redcoats before they reach Fort Duquesne? Can your Troupes de la Marine stop Rogers’ Rangers at Fort Ticonderoga? Will the Royal Navy sail up the St. Lawrence River to support operations against Québec? Can court intrigue at Versailles undermine the machinations of William Pitt (the Elder)? Find out as you develop, fortify, and defend New France in Empires in America. Now in an upgraded boxed edition, which includes the first edition content along with the expansion kit!